Anyone will enjoy the prospect of a thirty percent reduction in heating costs at home. 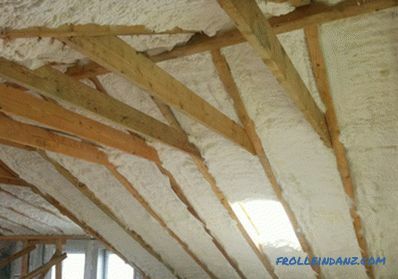 It is quite real - this is the result that can be obtained by choosing the right insulation for the roof. In addition, we will receive other additional benefits. About this - further. Let's calculate what our house gives insulation to the roof. We emphasize - not anyhow any, but a good insulation. Perhaps now it is clear that a roof insulation is necessary. But for different types of roof and constructive solutions, different types of heaters are used. We will discuss this further. A roof is considered to be flat with an angle of inclination of up to 12 degrees. It is easiest to cover it - do not bother with additional elements and tinker with the crate. It can be either unexploited or exploited. In the latter case, the roof is equipped with a solid and solid foundation - because it takes a lot of load. When choosing a heater for a flat roof, you first need to decide whether it will be used. If so, then we take a heat insulator with high moisture resistance and a load limit of up to 250 kilograms per square meter. 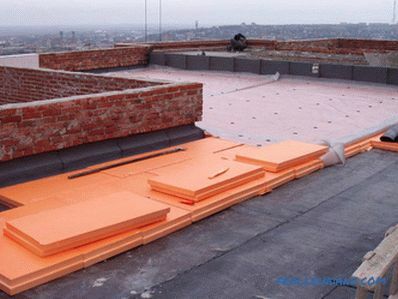 For a non-operated roof, the load limit may be lower, but the moisture resistance requirement must be observed. 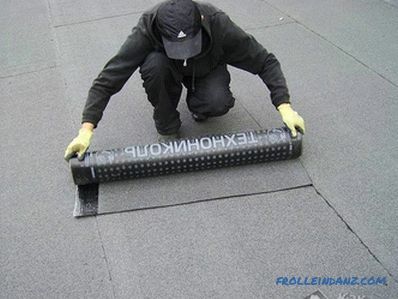 As a rule, a flat roof is insulated with expanded polystyrene (ordinary or extrusion type), less often basalt fiber mats are used for this purpose. Warming of a flat roof with extruded polystyrene plates. An example of warming a flat roof with mats of basalt wool. Expanded polystyrene weighs little and costs somewhat less. Processing it is also easy, and even a special tool is not required. Styrofoam keeps heat just fine, since almost all consists of air. Of the disadvantages of this heater should be noted flammability. Therefore, a non-flammable protection in the form of a sand-cement screed is applied on a flat roof on top of this heat insulator. We found above that insulation of a flat roof is best to use expanded polystyrene plates, now consider the most popular manufacturers of various types of insulation based on polystyrene foam. The older name for insulation is PENOPLEX 35. Manufactured by a Russian company of the same name, it is nothing more than extruded polystyrene foam. It is produced in the form of slabs with a thickness of 2 to 10 centimeters, measuring 0.6 by 1.2 meters. And the density of this insulation for the roof - 28-33 kilograms per cubic meter. And again production of the Russian company - TechnoNIKOL. Extruded polystyrene, produced under this brand, has several varieties. For the insulation of the roof are applicable the following. XPS TECHNONICOL CARBON ECO - suitable for the roof of a low-rise house or country mansion. XPS TECHNONICOL CARBON ECO DRAIN - differs from the previous material by the presence of drainage grooves on the plates. They help to ventilate the flat roof. CARBON PROF - extra strong polystyrene foam. Great for roofs of high-rise buildings, shops and warehouses. 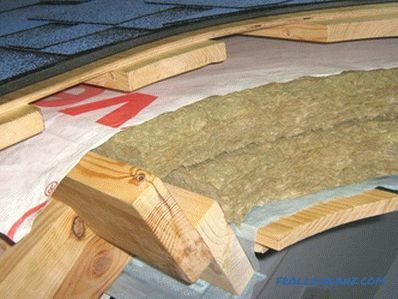 This hard insulation for the roof can withstand enormous loads. CARBON PROF SLOPE - as strong as the previous material, but has a special "chip". It is a set of five plates with different inclination of the surface. With their help on a flat roof make the slope. # 3. Styrofoam brand URSA XPS. The manufacturer (international holding URALITA) guarantees this heater excellent quality. The flame retardants included in its composition, contribute to improving fire resistance. This material is good for an inverted roof operated. On the side of its slab, there is a cut-out that ensures perfect fit and lack of gaps. 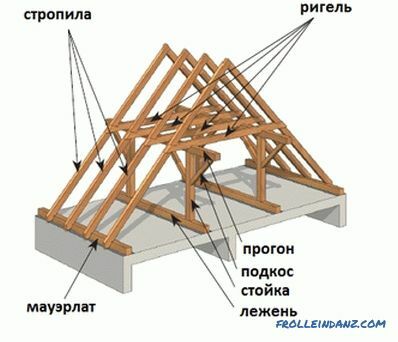 This type of roofing is most common in private construction and I vlyatsya the most popular. Consider what insulation is better for the roof of the inclined type. A warm roof is a roof in which a heater is mounted directly on the roofing slopes between the rafters. 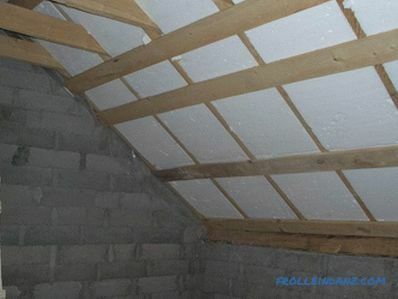 This method of roof insulation is used when it is planned to arrange an attic in the attic. Cold ventilated roof. In this case, only the lower part of the roof is warmed, and the slopes are left alone to the joy of the winds. It is impossible to live in such an attic - it is suitable only for household needs. In the beginning we consider the so-called warm roofs. This roof has a slightly more complex structure than the flat one. For its thermal insulation, a so-called “roofing cake” is created, which includes insulation for the pitched roof, a vapor barrier layer and a moisture protection layer. Otherwise condensation will inevitably occur. The main thing in the insulation of slopes is a good fit of the insulator to the rafters and the crate. An example of a roofing pie for a roof covered with shingles. From top to bottom: shingles, lathing and foundation for roofing, moisture protection, insulation, vapor barrier. # 1. Basalt wool is the most fireproof of all heaters. 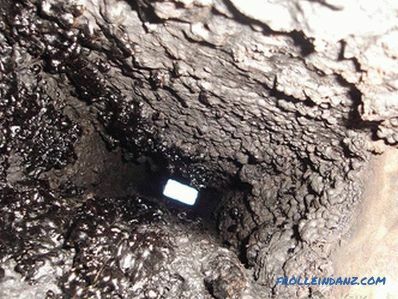 It has low thermal conductivity, high environmental friendliness. This cotton wool does not like mice with rats, it does not get wet in the rain, it is easy to cut with a knife and weighs little. And it is very elastic. Warming of the attic with basalt wool. # 2. Polyurethane - this insulation is made directly on the construction site and is applied with a special pistol into the inter-core space. At PPU wonderful adhesion with any surfaces, small weight, monolithic layer, long (50 years) service life. And the fire is not terrible for him. But for its spraying, special equipment and involvement of a specialized team, which performs these works, will be needed in the process of insulation. Roof with polyurethane foam applied between the rafters. # 3. Ecowool - 80 percent consists of cellulose fibers. The rest is antiseptic and refractory additives. 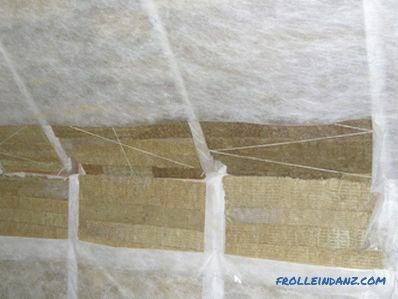 This "breathing" insulation does not take either a fungus or a mold. The coating is seamless - it means there will be no cold bridges. Ecowool allotted to serve for 50 years, no less. It absorbs noise well and saves heat better than polystyrene foam. 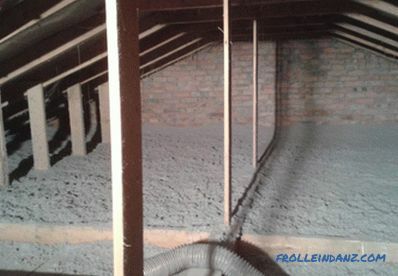 The attic is insulated with ecowool. # 4. 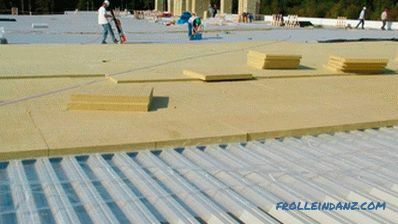 Penoizol is a modified foam, for sloping roofs it is more often used in the form of slabs. This elastic continuous coating does not burn (and does not melt), does not get wet and has a low thermal conductivity. Attic heated with penoizol plates. 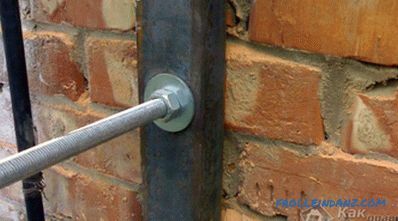 All heat insulators listed above are suitable for a cold roof. But besides this, you can use glass wool, which has a budget price. It does not burn, is environmentally safe, does not contain organics. If it is tightly joined to the insulated surface, then the house will be warm. 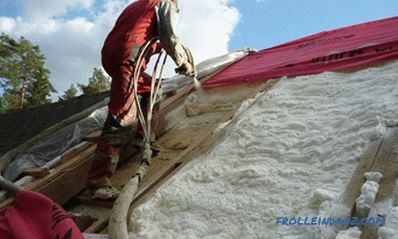 Different types of insulation for roofing on the basis of fiberglass is not recommended for insulation of roof slopes. This is because, due to their weak elasticity, they will eventually begin to lag behind inclined surfaces. As a result, the level of thermal insulation will significantly deteriorate. # 1. Stone wool from basalt. The manufacturer Tehnonikol produces this heater in rolls (Teprololl) and in slabs (Rocklight). For skates, rolled basalt wool is more suitable. In addition, you can name the products of the Danish company Rockwool and Laynrok Light slabs. Isover sloped roof is a material produced by French concern Saint-Gabin according to TEL technology. These plates are 5 and 10 centimeters thick and 61 centimeters wide. Knauf insulation glass wool is produced by the largest German company in the form of rolls 1.2 meters wide. Innovative technology made it possible to obtain virtually non-caking material. URSA GEO fiberglass insulation is distinguished by a large length of thin glass fibers, due to which the air gaps between them lot. It saves more heat. # 3. Polyurethane foam and penoizol. As for polyurethane foam and penoizol, the manufacturers of these heaters are very much.If you decide to use any of these types of insulation, then find a specialized company in your region that deals with the insulation of the premises using these thermal insulators.